Hi guys! 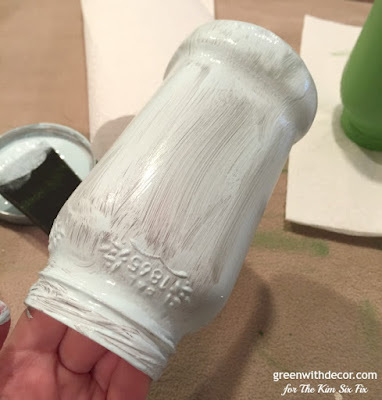 It’s Meg from GreenWith Decor back with a fun spring DIY project. 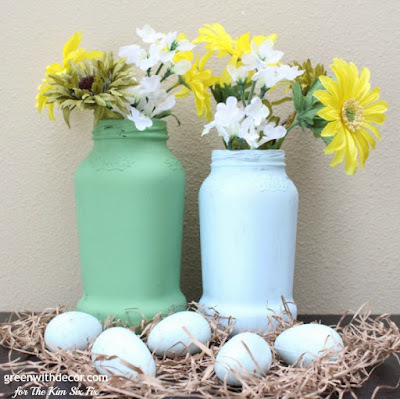 It’s still a bit chilly here in Wisconsin, but I’m willing spring to arrive with all of my spring decorating inside! I love using old glass bottles and jars for decor. In fact, my spring mantel this year was full of them! 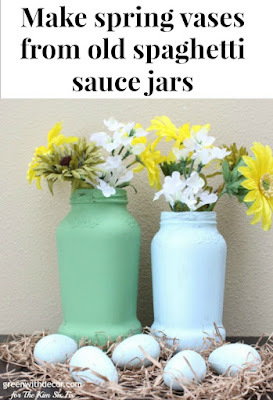 I wanted a little something for spring in our family room, too, so I rummaged through my jar stash to find a couple jars I could use as vases for spring flowers. 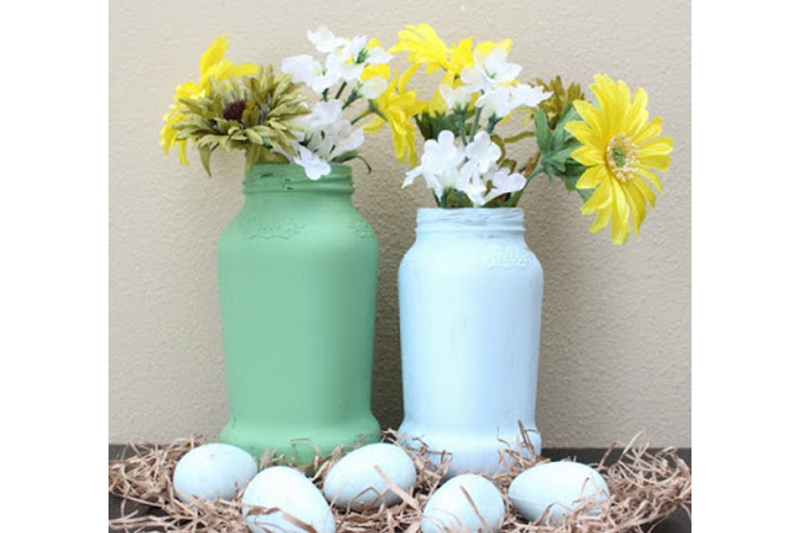 Aren’t they perfect for spring?! This is an easy tutorial you could use for any season of the year. 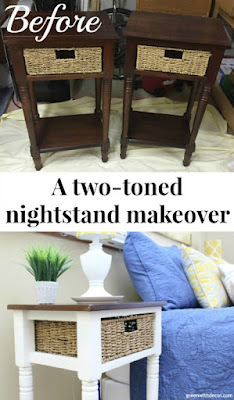 I love switching out decor pieces each season, it always gets me excited for what’s next! 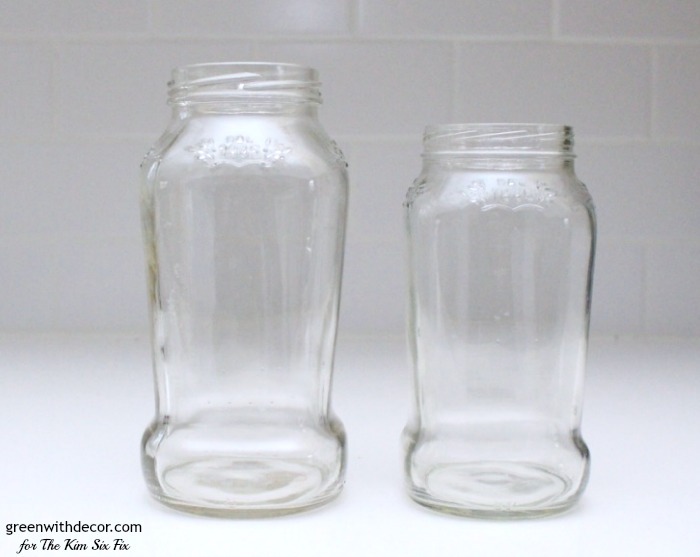 Plus these jars are so little, they’d be easy to store for use year after year. If you’re using old food jars like I did, peel the labels off. Sometimes running the jar under hot water helps. 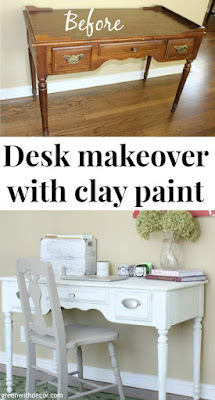 You can really use any paint for these, but I love the look of clay paint. It’s similar to chalky paint and gives that kind of textured look to painted pieces. 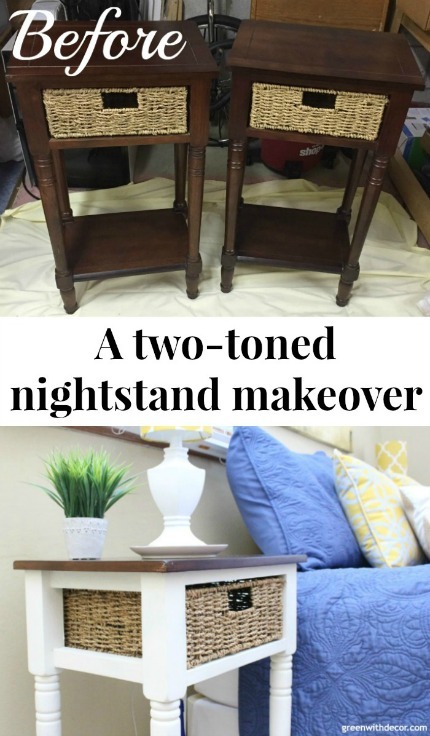 I’ve used it on several furniture makeovers, and I always love the look of it. 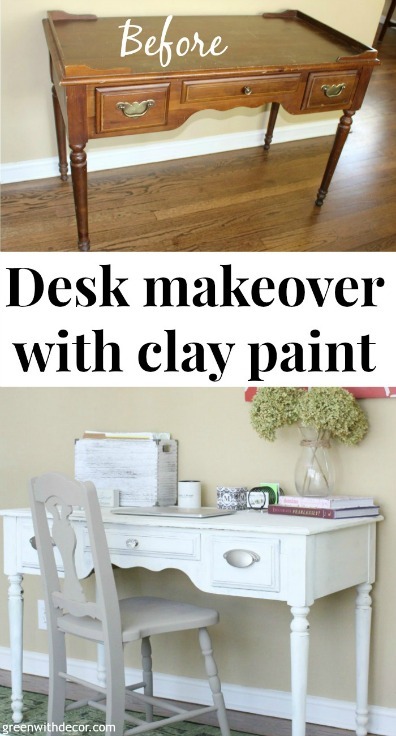 I gave each jar two coats of paint, being sure to apply the paint with brush strokes going in the same direction each time. 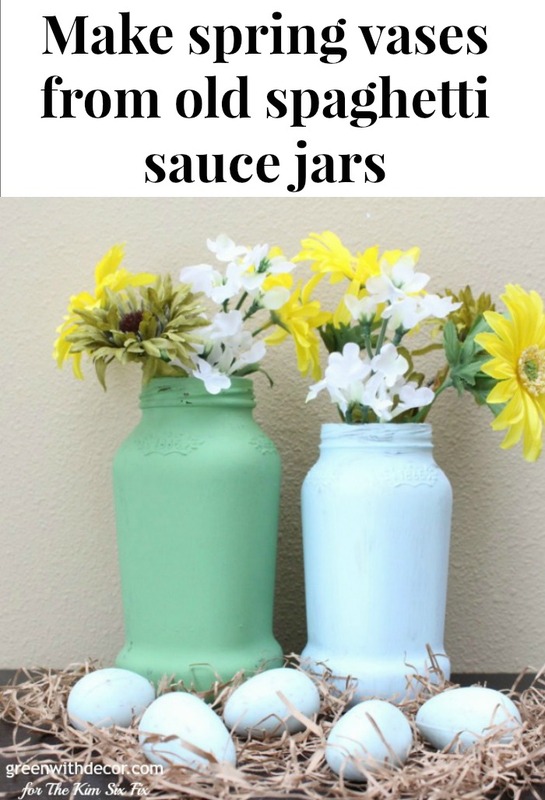 This gives jars a more finished look when you’re done. 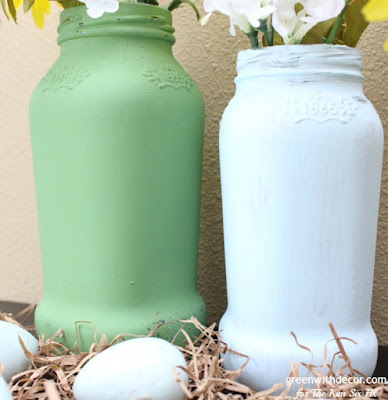 Around the tops of the jars, I didn’t cover them with paint completely. 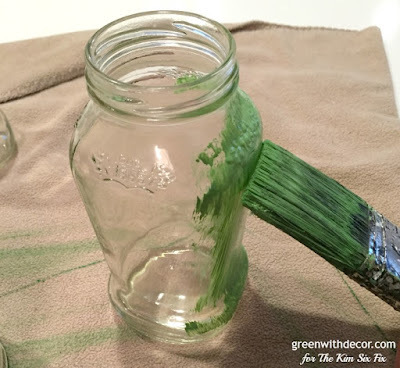 Instead, I did some quick brush strokes, leaving a bit of jars plain to give them a more rustic look. Sometimes it’s best to be patient. I used clear/natural wax, but if you want a more textured look, you could use dark wax or glaze. I tend to stick to the clear wax just because I like it, but it depends on the look you’re going for. 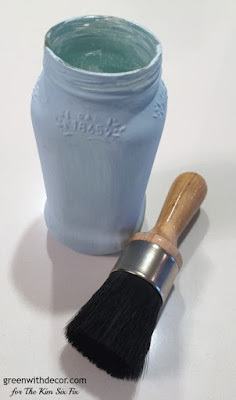 Swirl your wax brush in the wax container, then apply the wax to the jars using a circular motion. Use a clean cloth to wipe off an excess wax. Then plop in some spring flowers and display. Bonus points if you have little eggs to display with them, too! Even if it’s still cold outside, the bit of spring inside is a good reminder that warm weather is coming!